This is the agreement that led to the killing of U.S. President John Fitzgerald Kennedy ( JFK ) 22 November 1963. This is the covenant which then triggers the imposition of Bung Karno from the presidency by the CIA network using Soeharto ambitions. And this is the covenant which remains a mystery to this day in the history of mankind. And, this is the covenant that often kept busy every person who becomes President. And, this is the covenant that makes some people crazy spread money to get a piece of this property that became known as " one of the " treasures Amanah Rakyat and the nation of Indonesia. This is an agreement by the world community as a Timeless Treasure of Mankind. Here then is the target of a secret team working Soeharto torture Soebandrio et al that open mouth. This is the agreement made ​​when he became President Megawati bill promises to Switzerland but could not as well. Though Megawati has said that he is President and he is Princess Bung Karno. But still can not. This is then made ​​SBY then formed a secret team to track down the treasure which then also remained barren. All the fuss made ​​by this perjnajian. 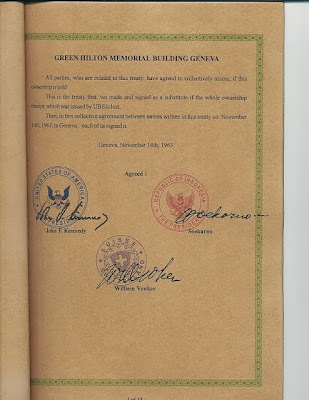 The treaty called " Green Hilton Memorial Agreement Geneva ". 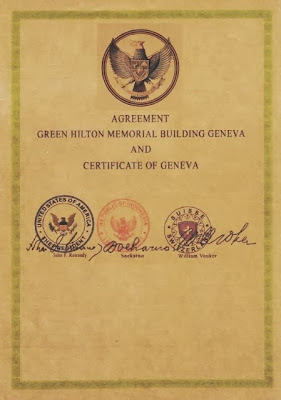 The world's most expensive deed was signed by John F Kennedy as President of the United States, Ir Sukarno as President and William Vouker representing Switzerland. 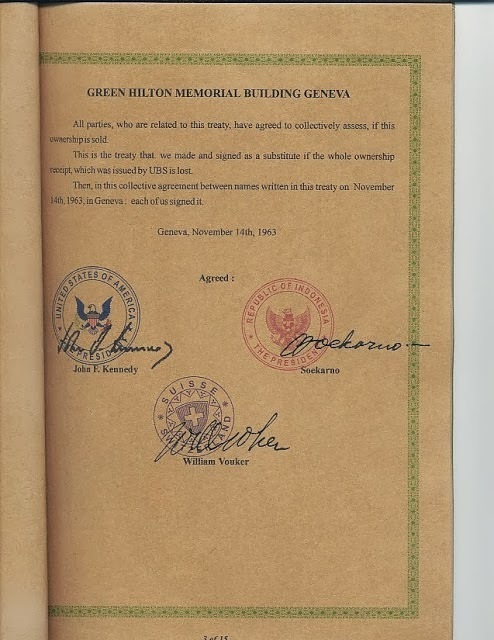 This triangular agreement made ​​at the Hilton Hotel Geneva on 14 November 1963 as a continuation of the 1961 MOU made ​​. The point is, the U.S. Government recognized the existence of gold bars worth more than 57 thousand tons of pure gold which consists of 17 packets of gold and the gold bullion that Indonesia received a collateral for the U.S. financial world that its operation is done by the Swiss Government through the United Bank of Switzerland ( UBS ). On the other unpublished documents mentioned, the use of the collateral the U.S. must pay a fee of 2.5 % a year to Indonesia. However, the fear of appearing corrupt leadership in Indonesia, then the fee payment is not open. It means the right of the fee disbursement authority are not on anyone the President, but there is at perbankkan system that has been created in such a way that redemption was not easy, including the U.S. President himself. This special account created to hold the assets that until now no one knew of its existence except John F Kennedy and Sukarno himself. Unfortunately before Sukarno died, he has not had time to give the mandate of redemption to anyone in the country. Even if there is a claim that it was he who believed Bung Karno to liquefy assets, then a person is lying, unless there are specific signs such as important documents that do not know who that stores until now. According to a source in the Vatican, when the U.S. President expressed the intention of the Vatican, the Pope was asked whether Indonesia has approved it. Reportedly, the U.S. simply exploit the fact MOU between the G - 20 in the UK where Indonesian President Susilo Bambang Yudhoyono ( SBY ) participated signed an agreement to provide the world's financial authorities IMF and the World Bank to seek alternative funding sources. The legend says, the Vatican ordered that Indonesia be given assistance. Possible IMF aid of USD 2.7 billion in facilities SDR ( Special Drawing Rights ) to Indonesia last summer is the realization of this deal, so there is a growing issue that such assistance does not have to be returned. By Bank Indonesia for the IMF assistance is used to strengthen the country's foreign exchange reserves. If it's true, then how nistanya Indonesian people. If it really happened how stupid our government on this issue. If this was true how helpless this nation, only gets USD 2.7 billion. Though the property is worth a thousand trillion U.S. dollars. Asset that is not free of heritage asset, the asset is the hard work of our ancestors in the era of the golden age of the kingdom in Indonesia. 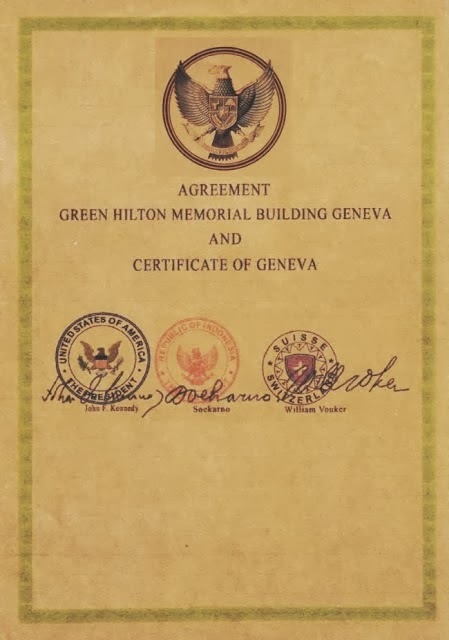 Origin Agreement " Green Hilton Memorial Agreement "
After the world war ended, the countries east and west of the belligerent began to rebuild its infrastructure. However, the impact of which has been given by the war not only materially but also psychologically overwhelming. Social and religious upheaval happening everywhere. People fear this war will happen again. Western governments are heavily involved in World War I tried to calm people, saying that the people will soon enter the era of industrial and better technology. Jewish bankers know that the eastern countries in Asia are still a lot of store of gold reserves. The gold will be in use as collateral to print more money which will be used to develop and master the technology industry. Because information technology is waiting in the days to come. Elders Mason who worked at the Federal Reserve ( Bank of America ) with the bankers of the Bank of International Settlements / BIS ( Central Bank of Central Banks from around the World ) visited Indonesia. Through a meeting with President Soekarno, they say that the name of humanity and prevention of reoccurrence world war that had just happened and destroy all the countries involved, each state must reach an agreement to leverage collateral Gold owned by each country for humanitarian programs. And all countries agree on that, including Indonesia. Finally there was agreement that the gold - gold mine east countries ( Asia ) will be submitted to the Federal Reserve to be managed in humanitarian programs. As the exchange, the Asian countries accept Bonds and Certificates Gold as a sign of ownership. Several countries involved such as Indonesia, China and Philippina. At that time, the influence of the eastern world leader Sukarno as a very large, until Americans feel worried when Sukarno was so close to Moscow and Beijing which incidentally is the enemy of America. But a few years later, Sukarno began to realize that the agreement between the countries east with the west ( Bankers - Jewish Bankers and financial institutions the world ) is not on the run as they should. Soekarno foul smell conspiracy carried out by the Jewish bankers who are part of Freemasonry. There is no humanitarian programs that are run using the collateral. Sukarno protested loudly and quickly realized eastern countries have been deceived by the International Bankers. Finally In 1963, Sukarno cancel the agreement with the Jewish Bankers and transfer the right to manage the gold - gold to U.S. President John F. Kennedy ( JFK ). when the U.S. is massively in debt after being involved in a world war. President JFK wanted the state to print money without debt.